There’s no doubt that social media has become a huge aspect of political campaigning. Not only was it the british public using the likes of Twitter and Facebook but the parties themselves used the #vote to reach out to their potential voters. Why? Because this is a quick, fast and efficient way to communicate with the public. During the election period, a study was carried out by researchers at Oxford university which showed how the Labour Party dominated traffic on Twitter during the UK general election campaign. 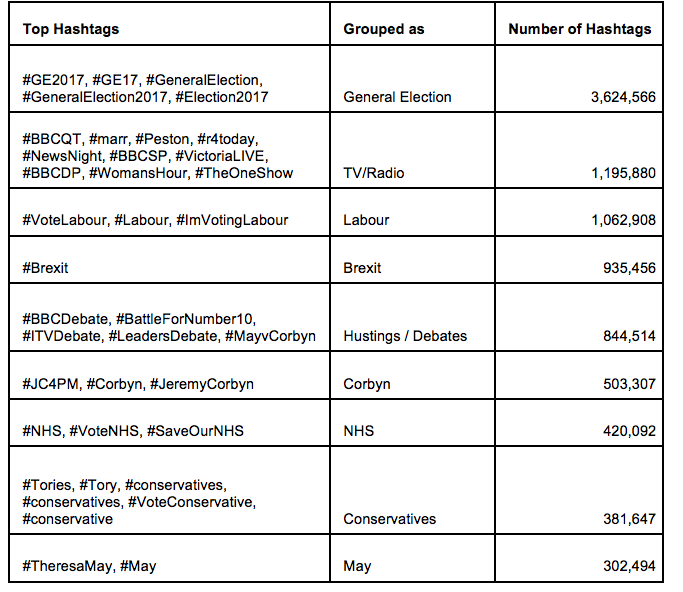 The research that was then analysed showed that over 1.3 million tweets produced between the 1st of May and the 7th of May 2017,were using hashtags associated with the primary political parties in the UK, the major candidates, and the election itself. Labour Party hashtags appeared the most often in political tweets (39.7% of party-specific tweets). Conservative Party hashtags accounted for 26% of the total. The SNP is ‘disproportionately’ representeded in Twitter conversations (19%), given the party’s size. UKIP: 9.6%; Lib Dem: 5.7%. Below is a table which shows us what the top hashtags were during the 2017 general election period.